Product information "Focus Optics Ruby 14-24mm T2.8 PL Mount Lens - used"
The Ruby from Focus Optics is a rehoused and reengineered Nikon 14-24mm. This rehousing allows the Ruby to work on all 35mm PL mounted cameras incuding Arri , Sony, and the Red. The Canon 7D can be used with an additional adapter upon request. The Focus direction was reversed, to allow pull for cinema direction. The focus was expanded to travel 126 degrees. Close focus is set to an astounding 1''. We have engineered the Ruby with a proprietary anti back lash design to allow for complete accuracy when pulling from macro or infinity. 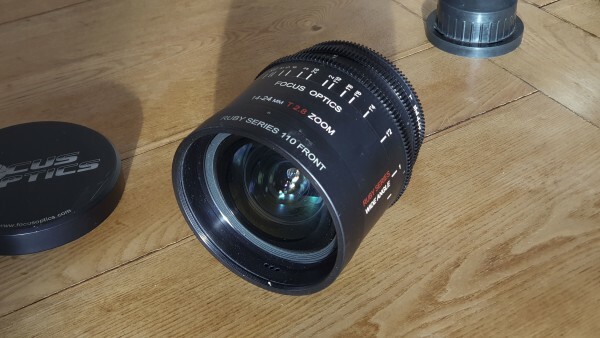 Related links to "Focus Optics Ruby 14-24mm T2.8 PL Mount Lens - used"
Our comment on "Focus Optics Ruby 14-24mm T2.8 PL Mount Lens - used"
Customer evaluation for "Focus Optics Ruby 14-24mm T2.8 PL Mount Lens - used"